We have come across a number of fascinating Eria species in our travels to the Himalayas and South East Asia. 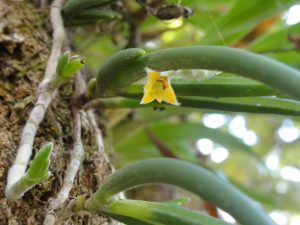 Eria javanica sounds as if it should be endemic to Java but is actually found through the Eastern Himalayas from Sikkim eastwards, South East Asia, Malaysia, Indonesia and the Philippines. The species is reported growing from sea level up to 1200m and we find that it enjoys conditions in our Warm Asia section (min 17C). The long spikes of fragrant flowers are produced from both this year’s and last year’s growths giving an impressive display of star like flowers. Most Eria species are hairy but in this species this is limited to a slightly hairy flower stem. 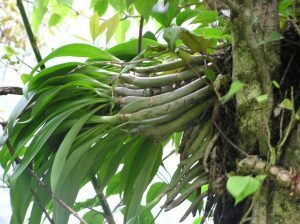 Eria pannea (photograph below taken in Laos) is one of the really hairy species with a hairy rhizome, leaves and flowers. 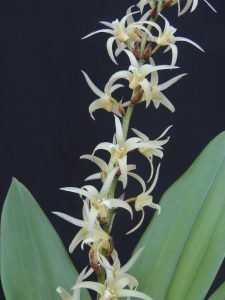 Eria pannea has no pseudobulbs at all and is very unlike Eria javanica. The two species below show some of the other diversity in growth form shown in the species. 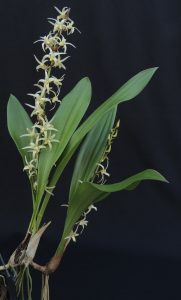 Eria paniculata has long stems rather reminiscent of epidendrum species. 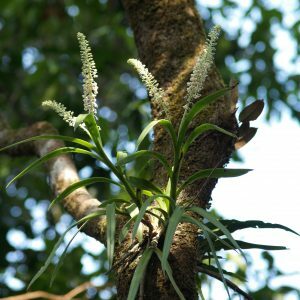 We photographed this plant in Laos but we have also seen it growing in Sikkim which is where the large pseudobulbed plant of Eria spicata was photographed.